It's a myth that Americans are fat because they are sedentary. Americans are no more sedentary than any other nation that has three or four hundred cable TV channels. They aren't fat because they never exercise. This writer lives in Greater San Diego, California, where the roads are packed with daily joggers. Seriously. You can't even throw a candy bar wrapper out of the car window without hitting one. Americans aren't fat because they eat too much. Americans eat three times a day, the same as the rest of the world. Americans are fat because they put cheese on everything. No one would have ever thought, fifty years ago, that this nation was on its way to geopolitical cheese supremacy. First off, there are only three kinds of American cheese: yellow, orange and whiz. Other kinds of cheese one can commonly find in a supermarket are clearly labeled as being of foreign provenance (Swiss, Parmesan, Mexican Mix) or belonging to some specific individual (Monterey Jack). How did this nation become so cheese-addled on such a pitifully small selection of cheeses? Consider that the French have over three hundred sixty varieties of cheese. But only three kinds of deodorant, critics of the French point out. Whatever. This column does not wish to make fun of the French, or to stereotype them as a bunch of smelly, mime shirt wearing people who eat snails. The French possess an old and honored culture, and their language is a repository of many of the world's great works of literature, not just something Lady Gaga (in French, La Dame Gaga) mutters between costume changes. On the other hand, there's nothing like those horizontal stripes in a mime shirt to accentuate love handles, or looking at a plate full of fresh snails to remind you you're supposed to be eating light, so the French may have a cultural edge in staying thin, but that's not enough to explain the bulging international fat gap. The truth is the French have not mastered cheese technology. They just cut lumps of their runny, veiny, off color cheeses and stick them on baguettes or snails and eat them in between bottles of wine. Of course it is impossible to gain weight on a diet like that, especially if you drink so much wine you cannot manage to keep the cheese on top of the baguette and the snails crawl away before you can eat them. The key to consuming enormous quantities of bland cheese was discovered here in the USA; melt it! On everything! Melting makes the cheese conform to the shape of whatever you wish to coat it on; unlike cheese perched on baguettes or even crackers, melted cheese will not get dropped on the ground, precious fat grams lost forever to the soil, unless you drop your whole patty melt. Melted cheese clings tenaciously to your pastrami, your sausage or your shirt. Melted cheese can be used to hold bacon, another valuable source of obesity, securely in place in a towering, triple-stack burger, minimizing the chance that the strip's crunchy essence will end up on the floor when bitten. Americans also led the world in deep-frying cheese. No other nation looked upon a lump of cold, congealed fat and thought Let's bread that puppy and soak it in even more hot fat! 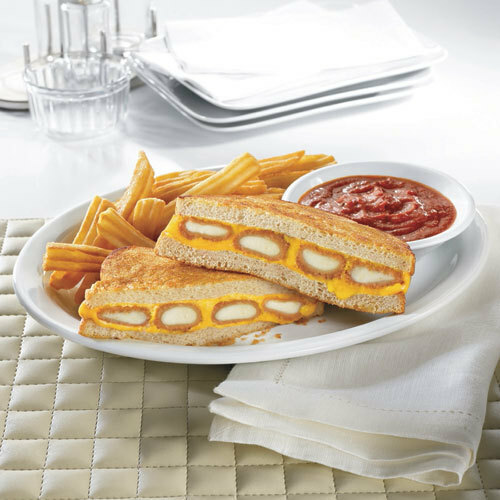 The Denny's restaurant chain features a sandwich made of three deep-fried cheese cylinders, each roughly the size of a roll of nickels, smothered in cheese slices and then grilled. Through some unfathomable corporate oversight, it is not served on cheese bread. Another source of cheese in America is the enormous cheese graters carried in bandoliers by wait people everywhere. "Would you like some grated cheese on that?" these cheese-pushers say, and we assent dumbly, even when we are eating oatmeal. The high point of the arc of American cheese history, however, is the cheese-stuffed pizza crust. No more monumental advance in cheese-mongering has ever been conceived. Taking a pie already bubbling with incandescent layers of melted diary goo and then surrounding it with a ring of pasteurized lard like a satellite orbit, so that it is impossible to eat any portion of the pie without padding one's arteries, was the man-on-the-moon moment of America's push for cheese-gobbling supremacy. And we did it all with only three kinds of cheese, and, unlike the French, over three-hundred sixty kinds of deodorant, making us the nicest-smelling fat people in the history of the human race. God bless us. so glad to be a vegan.